All EQUAL is a high school anti-bullying curriculum developed by internationally renowned bullying expert and clinical psychologist, Dr. Joel Haber. Originally under the name ARE YOU AN ALLY?, this curriculum is currently being distributed to over 10,000 high schools nationally with the potential for 10,000 additional. Beginning its second year, ARE YOU AN ALLY? is reaching hundreds of thousands of educators and students providing students with a peer to peer forum developing leadership amongst the student population and providing a platform to be an ALLY to other students. Dr. Haber’s vast knowledge and insight has made this curriculum the flagship in the efforts to stem the tide of bullying in schools and throughout society. through his knowledge and experience Dr. Haber has been invited, over the years, to sit on the board for may influential anti-bullying efforts such as the film “Bully” and has been invited two times by the US State Department to take his message to South Korea. 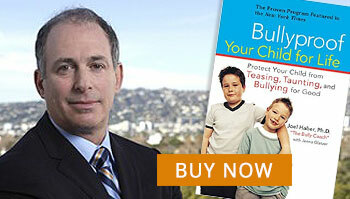 Dr. Haber also works with pre-school and middle school bullying in issues.